You are Queen Cobra, a superhero famous for your method of hypnotising troublemakers and gently persuading them to better ways. As your fame and experience grows, you decide you could use a little help... and frankly, a bit of femme company. What to do? Why, place a personal ad, of course! This is my first ever Ren'Py game for the Yuri Game Jam 2015. 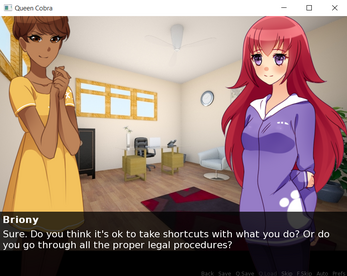 It's a very short game (~2500 words), with three love interests and twelve possible outcomes. I hope you like it! Download the .zip and extract to your preferred folder. 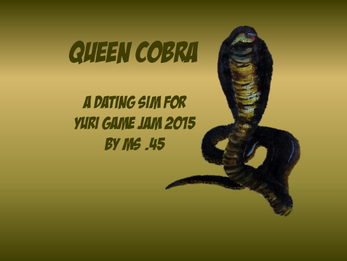 Double click "Queen Cobra.exe" to run. Should work in Windows, Mac and Linux, but please comment if you have any problems.